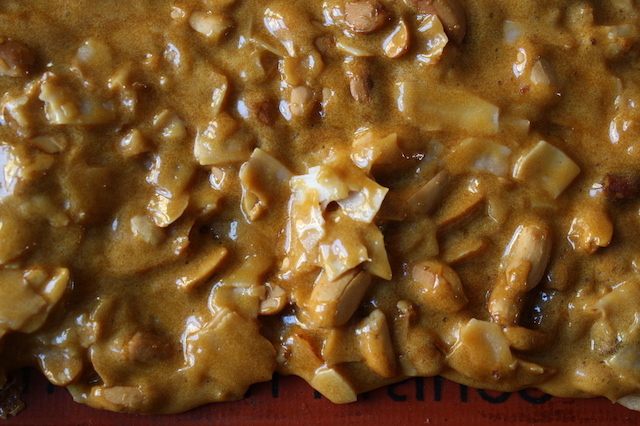 Since I already posted a wonderful spicy peanut brittle for this day a few years back, I came up with something new. A childhood friend’s mother used to make all sorts of old fashioned candies when we were kids – seafoam, pulled taffy and something called “peco brittle”, a peanut-coconut brittle. I hadn’t thought about it in years and realize now that peanut-coconut combination is sort of like those old fashioned candy bars I like so much, Chick-O-Stick and Zagnut. It’s a great combination so I did my best to recreate those old memories. It took a few tries to figure out the coconut. For the first batch, I grabbed one of the many bags of shredded unsweetened coconut I’ve somehow accumulated. It looked awful, all the little shreds made weird little lumps and strangely, it wasn’t very coconutty. Thinking a sweetened coconut might improve that, I tried again. Nope. Still not very coconutty and still looked terrible. So for the third batch I used the every trendy unsweetened large flake coconut and added a bit of coconut extract to pump up that flavor just a bit. Better – salty, sweet, nutty, just a little coconut flavor and it was much prettier. So there. It is, I think, pretty damn close to what I remember. Working off decades old memories is tough but when it hits, it’s a weird déjà vu kind of feeling. I was right back in Amy’s harvest gold living room, sitting on the shag carpet flipping through a box of index cards listing bootlegged movies taped right off the TV to play on their VCR. That, in a nutshell, is how I spent most of junior high. STRESS THERAPY BAKING FACTOR: CRACKLY WITH A HINT OF DANGER. There’s something slightly perilous and a little bit exciting about working with molten sugar. A brittle is a nice entry point if you’re new to the game. Just make sure you have a good thermometer (I like this one). Do not try to freehand this or do the ball of sugar in the water trick – things move too quickly at the end to easily pull this off. 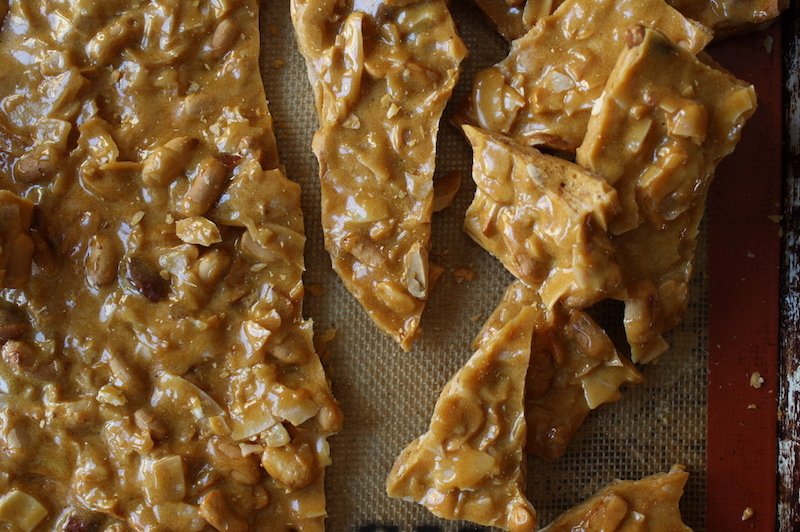 I do love a good peanut brittle and three batches is a lot of brittle. Though I gave most away, I help back a nice portion for myself. Of course I did. Once the sugar caramelizes, things move very quickly so it’s best to be prepared. In one bowl, measure the peanuts, salt and butter. In another, the coconut. Have the baking soda and vanilla/coconut extracts measured and standing by. And if you’d like it a bit spicy, add about ¼ teaspoon ground cayenne in with the coconut. Line a sheet pan with a silicone baking mat and measure out all the ingredients. Combine the water, sugar and corn syrup in a heavy bottomed large saucepan (4-5 quart), preferably a silver or light colored pot so you can easily see the color as the sugar caramelizes. Stir over medium-high heat until sugar dissolves then increase to high, insert a candy thermometer and bring to boil until thermometer reaches 250°F. Add peanuts, butter and salt. Continually stir to ensure the peanuts do not scorch. Bring the temperature up to hard crack at around 300°F. If the mixture looks a bit too light, let it continue cooking until lightly golden brown. I usually find around 310-315°F is right for me but as long as the mixture reaches at least 300°F you’re good. Once the proper temperature/color is reached, immediately remove the pot from stove and add the vanilla/coconut extracts and baking soda. Be careful – it will spatter and foam up furiously. Add coconut and stir quickly to combine. Try not to over mix and deflate the mixture. Pour onto the prepared sheet pan, gently spreading and smoothing the brittle to a thin-ish layer. Let cool completely, then break into pieces. Brittle will keep, tightly covered, for weeks.